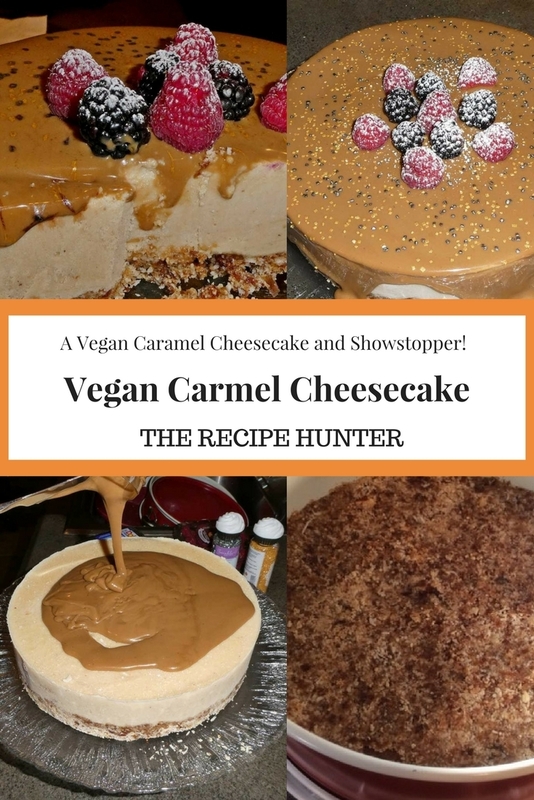 A rich and creamy, decadent dairy-free, vegan and gluten-free cheesecake! Make the caramel sauce in advance and keep in a sterile bottle till ready to use. Place all crust ingredients into a food processor and process until it resembles coarse sand. As I have a rather small food processor, I divided the ingredients into 3 smaller batches, and it worked perfectly. At the end, I mixed all together and poured the crust into the springform pan and flattened it with the back of a wooden spoon. Again, I had to divide the cheesecake filling into 5 smaller batches to get the same results. Blend on high for two to three minutes or until creamy. At the end, I added everything back in the blender and blitzed it to get all mixed through. Pour the cheesecake onto the crust and lightly drop the pan on the counter to flatten the top and remove air bubbles. Freeze the cheesecake for at least 5 hours or overnight before serving. About 45-60 minutes prior to the feast, take it out of the freezer to thaw. Lightly and slowly pour the salted caramel sauce over the cheesecake (work from the middle out) and let it run a little over the edges to form those lovely drizzles down the sides. Combine the coconut milk, coconut sugar and salt in a medium-size saucepan and bring to a boil over medium-high heat. Be careful and on your guard, as it can and will quickly boil over, and you do not want that to happen. Think of the sticky mess you will have to clean up. Once boiling, lower the temperature and continue to lightly simmer the sauce for 30-40 minutes, stirring occasionally. Once the sauce has thickened to coat the back of a metal spoon, remove from the heat and add the coconut oil and vanilla extract. Pour into a sterile glass jar and seal till ready for use. Take the cheesecake out of the springform pan, remove the parchment paper and place on a pretty footed cake stander. After you poured the caramel on the frozen cheesecake, sprinkle the top with gold and silver edible sprinkles. Add raspberries and blackberries in the center and dust lightly with icing sugar. Hey Esme, Happy New Year to you and yours and I wish you plenty of new recipes and new bloggers in 2018 !